Kat and Karl : what the buzz? Anyway, the Buzz about Buzz was crazy Buzzy. Then a bunch of privacy issues arose and everyone was all F YOU GOOGLE and I HATE IT. People were (are) confused. WHAT DOES IT DO? IS IT TWITTER BUT WITH MORE THAN 140 CHARACTERS ? DO I NEED ONE MORE THING TO CHECK AND UPDATE? PEOPLE CAN FIND ME! So what does Buzz DO? It aggregates a lot of content in one place and places it in a stream (similar to Facebook and Twitter and pretty much any other site dedicated to Social Media. Many compare it most closely to Friendfeed). Buzz 'connects' to sites you use and pulls the feeds to your Buzz stream. (If you do not know what the word feed means please stop reading and email me and we can chat. Er, type.) Anyway, Buzz does not place feeds in your stream unless you choose to do so.and you can choose which contacts see what. It's particularly easy to connect if you already have a Google Profile. (Which you should.) 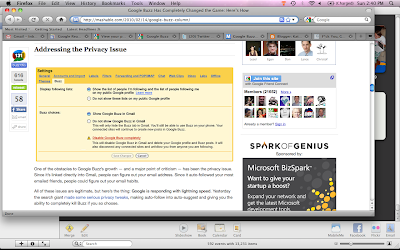 It also allows you to "share" items from your Shared Items in Google Reader in your Buzz stream. Additionally, it allows you to create orignial "Buzzes" which is basically a status update (FB) or a tweet (Twitter.) Individuals can respond to your Buzz similar to commenting on a blog - conversationally and post-specific. So, for example, my friend Jenny and I currently share all these things online: photos, videos, blogs, and our twitter accounts. Instead of having her send me links or instead of visiting or subscribing to FOUR separate sites it could all be in my Buzz stream. WHICH IS IN MY GMAIL INBOX. For me, that sounds convenient and awesome. Anytime I have my laptop open, my Gmail Inbox is open. There is a Buzz tab directly below my Inbox tab within my inbox that shows the number of new posts/buzzes that I have to look at. Additionally, if someone responds to a Buzz I posted or a Buzz I posted a comment on, it sends a notification/email to my inbox. Additionally, Buzz 'autofollows' your most frequently emailed contacts so you don't have to "friend" them like on Facebook or "follow" them like on Twitter. For me, I like this feature and am totally fine with it. But I use my gmail account mainly with friends and family and not professionally or as a method to forward/funnel other email accounts into one account. It has definitely been the feature that has received the most criticism. It allows your followers to see both your email address and discern your email habits. Think: A reporter whose "anonymous" sources could be revealed. Or: A recently divorced person who needs the ex to see none of their personal information. The recent changes to Buzz now auto-suggest as opposed to auto-follow and allow you to block it/disable it completely. Here is a link to a recent Mashable article re: the privacy concern changes. I really feel like this is Google's attempt to GET IT ALL IN ONE PLACE. This appeals to me as I have accounts for upward of 3oo internet services. (That might not be that far of an exaggeration. When it comes to the internet, it's safe to say I try it all.) I also have no qualms about sharing information on the Internet. I AM TRANSPARENT. I should add that I think if you have your own blog domain/feed or Wordpress, it doesn't appear to be able to pull into Buzz at this point. A suggestion I have seen to combat this to this: subscribe to and "share" your own blog posts through Google Reader. 1. DUPLICITY. It already annoys me when people update Facebook and Twitter with similar thoughts (or the exact same.). So, now I run the risk of seeing a Tweet, a Status Update, and a Buzz? Shudder. Many people are not pulling their Twitter feeds into Buzz b/c of this. There is no way to pull your FB updates. There also will now be Duplicity with Buzz RSS feeds and my Google Reader Feeds. I adore Google Reader and not sure I like the (inevitable?) convergence of the two. 2. BLOG COMMENTING. When my blog post comes up in Buzz, people can comment on it there. This is fine but I think but has the potential to detract from a true discussion on a particular post. 3. TWITTER. People are just getting used to Twitter and it's varying clients/applications (TweetDeck, EchoFon, UberTwitter, etc.) Twitter is not going anywhere, so it will be interesting to follow the interactions (battle?) between the two services. They are different. 4. FILTERING. There doesn't seem to be a way to filter or tweak what others share to avoid the OVERSHARE. Final note: If anything I reported on Buzz is incorrect please email me and I will make a correction. I've been waiting for you to talk about buzz and explain it to me!! :-) I still don't know if it's gonna be a good fit for me, but I also never thought I'd love twitter as much as I do now. And I do love that it's in my gmail which is ALWAYS open on my laptop... so the jury is still out for me! I think the blog post commenting issue has me sort of glad that Buzz doesn't pull from my WP platform. At first I was annoyed. Then I did the "share" bit with Reader. But then I had a couple of comments on my posts that I would have MUCH rather had captured on the post itself. What would be nice would be for it to automatically post the permalink to a new post each time. I guess there are ownership issues with that, though, and perhaps that's why it's only pulling Blogger feeds--that's the only way it can be sure you actually own the blog account. Nice, clear post, by the way. I like the idea of a Techy Tuesday. techy tuesay may be the worst idea you ever conceived. worse than the time i tried to stand on your feet with my feet and hold onto the ceiling for leverage. we all know how that went down. I have a buzz account and am kind of paralyzed by using it, so you've inspired me to open it back up and get it rolling. your sister is so kind! IMO, the upside to blog commenting is that i can't get to blogger on my work server but i can do gmail - so if i had BURNING THOUGHTS about a blog i could still tell that person without having to star the post and remember to go comment later when i certainly wouldn't, and it would be slightly better for them than an email about it. But I still haven't thoroughly explored Buzz at ALL. Unlike other sites, you have to kind of tell it what content you want (which is good don't get me wrong) so there isn't much on mine yet. I think I need you to email me with more details. do you use picasa? i have it on my computer, but i feel like it has slowed everything down, which could also have something to do with the fact that i use my ancient school laptop. thanks for writing about the buzz; this helped me sort it out in my head. i still remain overwhelmed by it, but that will ease in good time the more i use it, i suppose. we need to get our project up and going. i am excited. Confession: I skipped this post as you suggested. Seriously, how did we have the same job in the IT department? The other day I was cursing my printer cause I couldn't get it to work off my laptop, only to realize 15 minutes later, it wasn't connected! Yeah, I'm not a techi. But I love that you are and that's why I call you and Karl with all computer related questions.